Most feline infectious diseases affect only cats (and most human infectious diseases affect only humans) but as a cat parent, you should be aware that some diseases can be transmitted between cats and people. These are called zoonotic diseases. 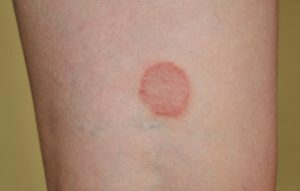 Although the name suggests it, ringworm isn’t caused by a worm at all! It’s actually a fungal infection that affects the skin, hair and nails. Ringworm is quite common in cats and highly contagious! Also known as dermatophytosis, ringworm often spreads to other pets in the household – and to humans. A ringworm infection is characterized by skin lesions that typically appear on the head, ears and forelimbs, as well as patchy, flaky bald spots. If you have a cat with ringworm, you must carefully follow your veterinarian’s advice to prevent the fungus from spreading to your other pets – and to you! It’s typically treated with medicated shampoo or ointment and (in some cases) oral medication. To keep ringworm from spreading to your other pets or to you, bathe all pets in the house with medicated shampoo, wash all bedding and toys with a disinfectant that kills ringworm, get rid of items that can’t be thoroughly cleaned, and vacuum frequently — ringworm spores can live for up to a year! Toxoplasmosis is a disease caused by a single-celled parasite called Toxoplasma gondii. It’s is one of the most common parasitic diseases and has been found in nearly all warm-blooded animals, including cats and humans. Cats can get toxoplasmosis infection by killing and eating infected prey. This zoonotic disease can also be passed on from cats to humans. Toxoplasmosis may cause flu-like symptoms in some people, but most people affected never develop signs and symptoms. In cats, the disease rarely has any symptoms but may cause mild diarrhea and a loss of appetite. Caution should be taken, however, with cats and humans that are very young, in their senior years, or immune compromised. In such cases, toxoplasmosis can be dangerous or even deadly. 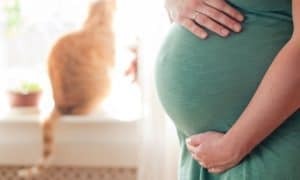 The most common way for someone to have contact with the parasite that causes toxoplasmosis is through unhygienic handling of raw or undercooked meat, drinking contaminated water, or exposure to areas where infected cats may have defecated. You will not get the disease through direct contact with the cat! Prevent the spread of toxoplasmosis by first having your cat tested for it. Then, by using proper hygiene while handling raw meat, wearing disposable rubber gloves when cleaning the litter box, not allowing your cat to eat wild prey, and keeping your cat indoors. Our next zoonotic disease is a major cause of “Travelers Diarrhea” in humans. That doesn’t sound very pleasant at all, does it? Giardia is an intestinal infection caused by the protozoan parasite Giardia intestinalis. Giardia is passed in the feces of an infected person or animal and may contaminate water or food. The most common symptom of Giardia in both cats and humans is mild to severe diarrhea. If you were to contract Giardia from your cat, you and your cat will both most likely be treated with the antibiotic metronidazole. 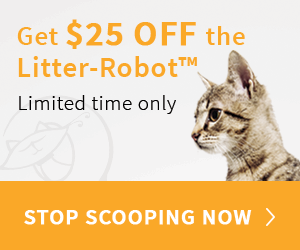 If your cat is diagnosed with Giardia, environmental disinfection and good personal hygiene are extremely important to keep from spreading it. In particular, people with immunodeficiency, such as AIDS or cancer, or who are undergoing chemotherapy, should use extreme care. To keep it from spreading, wash your hands, and use bleach or lysol to disinfect, and keep your environment as dry as possible. Cat scratch disease (also known as “Cat Scratch Fever” because of the popular song by the same name) is a bacterial infection that a person can get after being scratched, licked, or bitten by a cat or kitten. Cat Scratch Disease is caused by a bacterium called Bartonella henselae. Cats can get infected with B. henselae from fleas. By scratching and biting at the fleas, cats pick up the infected flea dirt under their nails and between their teeth. Cats can also become infected by fighting with other cats that are infected. The germ then spreads to people when infected cats bite or scratch a person hard enough to break their skin. 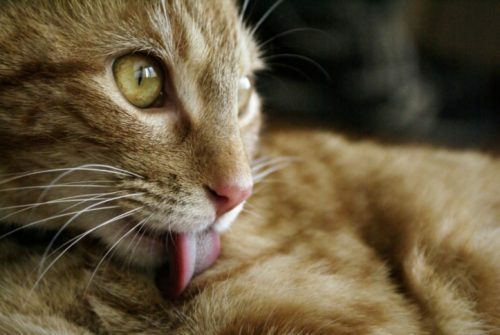 The germ can also spread when infected cats lick at wounds or scabs that you may have. About 40% of cats carry B. henselae at some time in their lives, although most cats with this infection show absolutely no signs of illness. In humans, however, Cat Scratch Disease will cause swollen and painful lymph nodes, infection at the scratch/bite site, fever, headache, and poor appetite. Prevent Cat Scratch Disease by using flea treatment on your cat, and washing any cat bites and scratches well with soap and running water. Do not allow cats to lick your wounds. Contact your doctor if you develop any symptoms of cat-scratch disease. Antibiotics are often used to treat Cat Scratch Disease, though the symptoms will usually go away on their own. Interestingly, having one episode of cat scratch disease usually makes people immune for the rest of their lives. Most viruses infect only their natural host species. Human viruses (like those that cause the common cold) infect only humans and can’t be passed to your cat, while feline immunodeficiency virus (FIV), feline infectious peritonitis virus (FIP), feline herpes, and feline leukemia virus (FeLV) infect only cats. 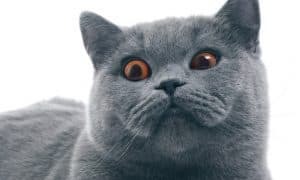 However, one virus that can be passed from cats to humans is rabies, a viral disease resulting from the bite of an infected animal. Cats are highly susceptible to rabies, which attacks the central nervous system, causing a variety of signs. It is almost always fatal. To prevent the spread of rabies, vaccination of cats is required by law in many areas. 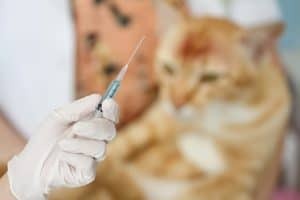 Even if your cat is kept indoors, it’s important to keep rabies vaccines current because cats occasionally escape outdoors, and because rabid wild animals such as bats and raccoons occasionally enter houses. To further reduce your risk of rabies, avoid contact with wildlife and stray animals. See a doctor immediately if you have been bitten by an animal. 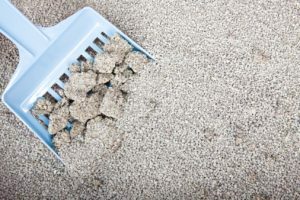 While you’re much more likely to get “cooties” from another human than from your cat, you should always use good hygiene and common sense when caring for a cat that has one of these transmittable diseases. I was recently hospitalized with C diff – put in isolation and treated with IV and oral antibiotics. My doctor said that my cats needed to be treated as well (and 2 of them did have diarrhea). The vet prescribed meds for all of my cats for several days, but I have since been hospitalized 9 more times with C diff. I don’t seem to be able to get rid of it. Can the kitties and I be passing this back and forth? 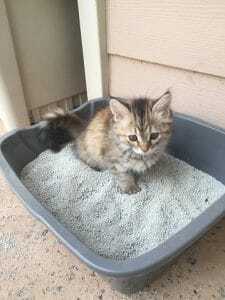 What are your cats being treated with and for how long? They were treated with Metronidazole 250mg – 1/2 tab a day for 5 days. I treated all of them when I came home from hospital and washed/disinfected with bleach per MDs instructions. Just to clarify – the cats were NOT washed/disinfected with bleach, my home was. The kitties only received meds. My first cat had mange when I got him. He slept with me from day one. After a couple of days I started to get little itchy red bumps on my arms. That’s right, my little kitten gave me mange. He was treated with those stinky baths at the vet and I had to get some prescription cream. Easy fix though. Can cats catch colds from humans?